Q: According to reports, in his state of the nation address to the parliament, President of the Republic of Korea (ROK) Moon Jae-in said that the country's ultimate goal is to realize peace of the Korean Peninsula, and there can never be any armed conflict on the Korean Peninsula under any circumstances without the ROK's consent. Pressure and sanctions are not the end, but the means to bring the DPRK to the dialogue table. What's you comment on this? A: We have noted the remarks related to the Korean Peninsula issue by President Moon Jae-in in his state of the nation address to the National Assembly. China and the ROK share important consensus and common interests in realizing the denuclearization of the Korean Peninsula, upholding the peace and stability of the Korean Peninsula and peacefully resolving the Korean Peninsula issue. Peacefully resolving the Korean Peninsula nuclear issue through diplomatic means serves the largest common interests of all relevant parties and is the shared aspiration of the international community. We support more efforts of the relevant parties for dialogue and contact and stand ready to enhance communication and coordination with the ROK to bring the Korean Peninsula issue back to the track of settlement through dialogue and negotiation at an early date. Q: The head of the International Department of the CPC Central Committee Song Tao has been in Vietnam and the Laos to explain the outcomes of the 19th CPC National Congress. Is the CPC going to send senior officials to the DPRK to have similar conversations? If not, why? A: As close neighbors, China and the DPRK maintain the tradition of friendly exchange between the two parties and countries. This serves the interests of China and the DPRK and is conducive to regional peace and stability. As to what you asked about the party-to-party exchange between China and the DPRK, especially whether China will send a delegation to the DPRK, I have no information to offer. Q: US President Donald Trump talked about the trade imbalance between China and the US, to which China always responds by saying the trade between China and the US is mutually beneficial and win-win in essence. How do you comment on that? A: We have stated our views on the relevant issue of China-US economic and trade relations multiple times. You mentioned that we have been stressing that the economic and trade relations between China and the US is mutually beneficial and win-win in essence. It is indeed so. If you view economic and trade relations between China and the US in an objective manner, it's never hard to arrive at such a conclusion. As the two largest economies in the world, China and the US are highly interdependent on each other. It's safe to say that we will swim or sink together. Indeed, with deepening and fast growing economic and trade cooperation, it is inevitable that certain differences and frictions may arise between China and the US. But we should be aware that this doesn't make the mainstream of China-US economic and trade relations. We indeed hope that the US will work with China for the shared goal, properly handle the relevant differences through dialogue and negotiation in a constructive way so as to ensure the steady and healthy development of China-US economic and trade relations. In September, the Spokesperson of the Commerce Ministry explained that China has never intended to pursue trade surplus and the current situation in China-US trade is utterly determined by market. From January to August, in terms of trade in goods, China's import from the US rose by 20.1%, higher than the growth of the total China-US trade volume and China's export to the US. In terms of the trade in services, China always has a deficit with the US. In the first half of this year, China's deficit of trade in services with the US grew by 36.5% year by year. This speaks volumes. Addressing the unbalanced trade between China and the US calls for the positive and concerted effort of the two sides. Following the successful meeting of the two heads of state at the Mar-a-Lago resort, China and the US have jointly advanced the 100-Day Action, conducted the first Comprehensive Economic Dialogue and achieved positive and tangible outcomes. We wish to work with the US to properly resolve the relevant issue through dialogue and negotiation in a constructive manner and uphold the steady and healthy development of China-US economic and trade relations. This is what the two countries and peoples aspire for, which also serves the common interests of the two sides. Q: The UN data show that a member state imported 1.6 million tons of coal from the DPRK in August and 500,000 tons in September. Are these the figures China reported to the UN? Does that mean it is in accordance with the sanctions? Has China stopped imports from the DPRK since September 5? A: China has been implementing the Security Council resolution in a comprehensive and strict manner, and faithfully fulfilling its international obligations. Q: First, President Xi Jinping replied to the DPRK supreme leader Kim Jong-Un's congratulatory message. Is that a customary practice? Does it have anything to do with the Korean Peninsula nuclear issue or the upcoming visit by President Trump? Does it mean any change in China-DPRK relations? Second, the US official said that the DPRK is stepping up its effort to develop more advanced intercontinental ballistic missile capable of attacking the US mainland, which testifies to the DPRK's speeding up of the missile program. Can you confirm that and how do you comment on that? A: I believe you raised the first question probably out of the instinct as a journalist, who often tries to interpret a lot even from a little information. We have received many congratulatory messages and letters on the success of the 19th National Congress from a large number of state leaders and heads of international organizations, and the Chinese leaders replied to express thanks in return. As close neighbors, China and the DPRK maintain the tradition of friendly exchange between the two parties and countries. This serves the interests of China and the DPRK and is conducive to regional peace and stability. I can't give you a confirmation with respect to your second question. However, I would like to stress that the UN Security Council has clear stipulations on the DPRK's development of ballistic missile technology, and China stated its position and attitude multiple times before. We hope that under the current circumstances, the relevant parties can do more things that will help ease the tension and bring the Korean Peninsula nuclear issue back to the track of peaceful settlement through dialogue and negotiation. Q: Is the Chinese government relieved to see that the Trump administration does not pay so much attention to the human rights issue in China as the previous US administrations? A: We have been fully at ease on this issue all along. The development of China's human rights are there for all to see. We have found a development path that suits the national conditions and we are fully confident in our path and system of socialism with Chinese characteristics. China has been ready to conduct exchange and cooperation on human rights with other countries on the basis of equality and mutual respect and learn from each other for common progress. Q: Reports say that there are GPS tracking data showing that a DPRK cargo ship entered into the port of Weifang, Shandong Province, which constitutes a violation of the UN Security Council resolutions. Can the Chinese side confirm it? How will the Chinese government deal with this if it is true? A: I don't know where you got this information. How can you arrive at the conclusion that China's implementation of the Security Council resolutions may be faulty, just because of these so-called GPS data? I can repeat that China has been thoroughly and strictly implementing the Security Council resolutions and faithfully fulfilling its international obligations. Follow-up: The reports are based on the tracking record of a firm specialized in global satellite positioning technology. This vessel not only entered into the port of Weifang, Shandong Province, but also sailed into waters near Liaoning Province and Yantai of Shandong Province. A: I am not aware of these details you said. If proved true, I believe relevant departments on the Chinese side will deal with it very seriously. I would like to reiterate that China has been thoroughly and strictly implementing the Security Council resolutions and fulfilling its international obligations. We are meticulously following the clear stipulations on what is prohibited in the Security Council resolutions. In the meanwhile, every country has the right to conduct normal exchange activities that are not sanctioned by the Security Council. May I suggest you broaden your vision and see how China has been making strenuous efforts for the proper settlement of the Peninsula nuclear issue through peaceful means. Q: The China-Philippines relations are developing rapidly at the moment. How do you comment on the current China-Philippines relations? A: Under the auspices of the Chinese and Philippine presidents, China and the Philippines have established very smooth and effective channels of communication and dialogue. The two sides have reached important consensus on managing differences on maritime affairs and the cooperation in various fields progressed smoothly. The Chinese government highly values and actively supports the anti-drug action by President Rodrigo Duterte, and have been providing strong assistance for the anti-terrorism fight in Marawi and the ensuing reconstruction. We are fully confident in the prospect of China-Philippines relations. We stand ready to continue to maintain close communication with the Philippine government under the leadership of President Duterte for stronger across-the-board cooperation and healthy development of China-Philippine relations. I believe this is also what the countries and people of the region aspire to see. Q: The king of Bhutan is visiting India. Yesterday, he was received by the Indian president. In their discussions, the president of India said that India appreciated Bhutan's support with regard to the Doklam crisis. The manner in which India and Bhutan stood together in this situation is a clear testimony to their friendship. Second, the technical hold on the listing of Masood Azhar as a terrorist is due to lapse today, which is with regard to the resolution by the US, UK and France at the UN Security Council on which China has put a technical hold earlier. As the technical hold expired today, is China going to extend that further or put another technical hold on that? A: As for the first question, we have noted the relevant reports. Both India and Bhutan are China's important neighbors. China stays committed to developing good-neighborliness and friendship with India and Bhutan and welcomes the development of normal state-to-state relations between these two countries. You mentioned the standoff in Dong Lang from June to August. China stated its stance on this many times. 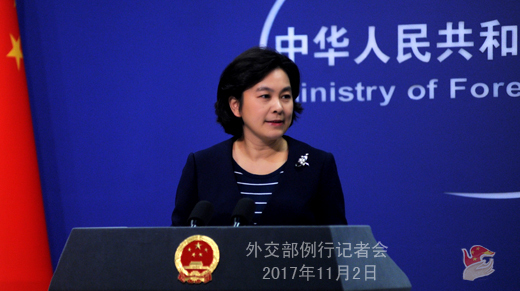 We believe that the proper settlement of the Dong Lang incident through diplomatic efforts serves the common interests of both China and India. We hope India will abide by historical boundary agreements, observe the principles of international law and work with China to uphold peace and tranquility in the border region. On your second question, as we said before, China proposed the technical hold so that more time was given to the Committee for deliberations and to all relevant parties for further consultations. Regrettably however, the Committee has yet to reach a consensus. The action we have just taken at the 1267 Committee is, as always, meant to uphold the authority and validity of the Committee. 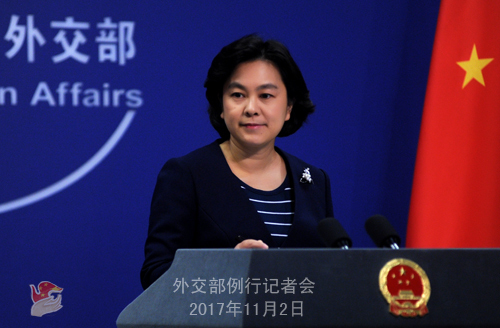 China would remain in communication and coordination with all relevant parties in line with the resolutions of the Security Council and the rules of procedure of the 1267 Committee. Follow-up: does that mean China has extended the technical hold again? A: The Committee has its own rules of procedure. As I said, there are differences over this issue in the Committee and it has yet to reach a consensus. Q: According to reports, on the afternoon of November 1, President of the Liberal Democratic Party Shinzo Abe won a majority in both the upper and lower house of the parliament and was reelected as Japanese Prime Minister, who would form a new cabinet. What's your comment on his reelection? Do you have any expectation for the China-Japan relations in the next term of Prime Minister Shinzo Abe? A: We have noted the establishment of the new cabinet in Japan. The steady and sound development of the China-Japan relations serves the fundamental interests of the two countries and peoples. China always calls for advancing healthy and stable relations between China and Japan on the basis of the four political documents and four-principled consensus between China and Japan and develops China-Japan relations in a spirit of taking history as a mirror and being future oriented. We hope the new cabinet will abide by the relevant documents and consensus, follow positive policies towards China, translate the remarks on the improvement of China-Japan relations into concrete actions and work with China to move the bilateral relations towards improvement and development in the right direction.